Pine is a classic flooring material and for good reason. It’s durable, affordable, and comes ready to be finished according to your tastes. Despite its popularity, however, pine doesn’t appeal to everyone, and there are some situations in which it isn’t a good fit. Learning the ins and outs of pine flooring will help you decide if this wood is a good choice for your home. Often chosen for its homey appearance and ability to stand up to years of use, pine has the added benefits of being easy on the wallet and on the environment. Pine is available in colors ranging from nearly white to golden yellow to deep, rich browns and reds. The wood’s prominent grain, pin holes, and knots give it character and an inviting, rustic appeal. Because pine flooring typically comes unfinished, you have the chance to finish your floor in any color that suits your preferences and the color palette of your home. 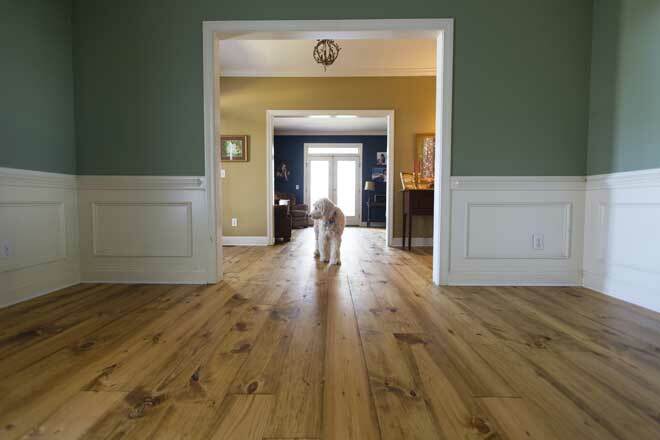 Tung oil alone will give the floor a traditional look and a warm glow. But pine also takes stain and paint well. If you prefer the wood’s natural color, treat your floor with clear varnish or whitewashing to prevent it from darkening with age or simply leave it untreated. As it ages, pine develops a distressed look with visible wear and a patina that many consider part of the wood’s appeal. Pine’s rustic appearance makes it a perfect fit for a log home or country cabin or for adding warmth to a modern interior or even a commercial office. Pine flooring is highly durable and around the country, pine floors of 100 years old or even older are still in use today. A pine floor will serve you well for the full life of your home, unlike a temporary floor covering such as linoleum. Pine rarely has problems with shrinking or swelling, although in a humid climate, it will benefit from a coating of polyurethane. As a softwood, pine grows faster than the hardwoods typically used for flooring, such as oak or walnut. Because of this, pine is better suited to environmentally friendly forestry practices. To ensure you’re buying a sustainable product, look for pine certified by the Forest Stewardship Council (FSC). Alternatively, look for reclaimed pine, which is salvaged from older buildings and available at many lumber suppliers. Softwoods, in general, cost less than hardwoods. Pine is often half the price of hardwoods such as oak, maple, and mahogany. It can even cost less than luxury vinyl tile (LVT), which is often designed to mimic the look of wood. While softwoods such as fir, cedar, and cypress are also lower in cost than most hardwoods, they lack the combination of properties that makes pine so popular. Pine shows wear faster than many wood species, and you’ll usually need to stain and finish your new pine floor yourself. If you prefer to keep your floor in pristine condition, pine isn’t the best flooring material for you. Like other softwoods, pine is susceptible to dents and scratches, and shows wear soon after it’s installed. You’ll need to use care when moving furniture or other heavy items across the floor to avoid causing deep scrapes or gouges in the wood. Although pine wood in general is durable, the durability of your flooring depends both on the type of pine you choose and the way you finish it, not to mention the amount of foot traffic it sees. Your floor will last longer if you stain it and seal it with two or three coats of polyurethane. Even if you find the look of moderately distressed pine appealing, you’ll still want to avoid installing pine flooring in areas that see heavy foot traffic or if you have young children or large pets. In these situations, pine can become heavily damaged. To stay looking their best, pine floors should be regularly dusted or vacuumed to remove debris that could cause excessive scratching and wear. Like other wood floors, pine floors also need to be refinished periodically by sanding, staining, and coating with polyurethane. How often you’ll need to do this depends on how much use the floor gets. In a home with only two adults, the finish could easily last 10 years. In a home with several adults, kids, and pets, you might want to refinish the floor every five to eight years. Refinishing adds to the lifetime cost of the floor. Pine flooring is typically sold unfinished, so if you want a specific color or you want to protect your floor from damage, you’ll need to do the job yourself. While this gives you more control over the look and durability of your floor, it also makes pine a more labor-intensive flooring option than wood that’s sold finished. The exact finishing process you’ll need to follow depends on your preferences. 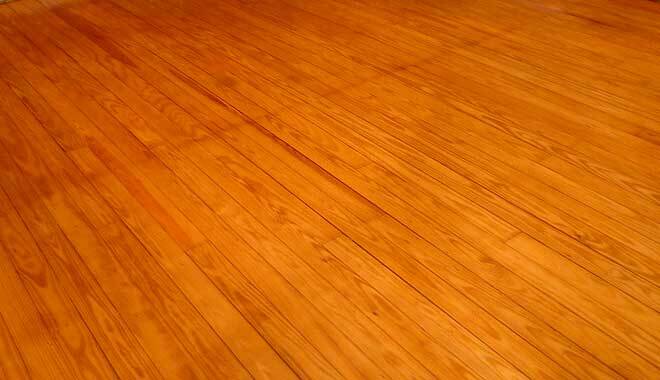 Typically, however, the process involves thoroughly cleaning the floor, possibly sanding and cleaning again, applying a floor sealant, applying a stain if desired, and finally applying two or three coatings of a protective polyurethane finish. You might also want to wax and buff the floor for extra protection, although you can do this before staining or without applying stain. If you’re looking for flooring that develops character as it ages and will last the lifetime of your house, and you don’t mind putting in a little effort to apply a stain or another finish, pine is an ideal option for you. If you prefer flooring that comes already finished, shows little wear, and you’re not on a tight budget, look for a hardwood flooring, such as solid oak or an engineered hardwood.